Wagner Chiropractic Heath and Wellness Centres. Strathroy. Parkhill. At Wagner Chiropractic & Wellness Centres, we are here to help. With a focus on health and wellness, discover what makes us different. At Wagner Chiropractic we are dedicated to being your source of everything health. We are a family wellness center focused on helping the people of Strathroy Caradoc and Parkhill live healthier lives. We believe that your body is designed to heal and thrive, yet many are not living up to their potential. In Canada today 50% of people are dying of heart disease and cancer both of which are preventable with the proper lifestyle. Do you want to be part of the 50% that are currently on their road to disease or be the ones that stand up and take responsibility back for their health? Convenient morning and evening hours available! For the month of March our biofreeze products are 15% off. This product is available in a spray, roll-on and a gel form. 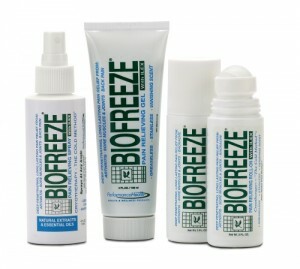 Biofreeze works as a cold therapy that can be applied while on the go or at work. It contains natural ingredients including Ilex, Arnica, Boswellia, Aloe; Green Tea; Lemon Balm and Burdock Root that work together to provide fast acting pain relief. This is one of our most popular products, so stop by the office today to purchase yours or pick up a sample. Do you suffering from foot; knee; hip or low back pain? It might be related to lack of support for your feet. Come into the office this month for a foot assessment to determine if orthotics could help your condition. If you have health benefits be sure to look up if orthotics are covered and what would be required to receive coverage.